Discussion in 'Dwarf Gourami' started by Xprox, Apr 13, 2017. I've had this dg for a few days now and noticed a strange bump forming on its side. Wondering if anyone knows what it is/if it could be contagious to my other fish in the tank. Also i have been watching him closely. He has still been eating i put in sinking pellets and he goes right for them with the other fish. He also has been swimming fine, The last picture is a little misleading as it looks like he is siting on the bottom. I actually took that picture was he was looking in the gravel for a shrimp pellet. Good pictures, Thanks. Nothing comes to mind but I'm sure someone here will have had experience with something similar and will give you imput on what to watch for or what to do. Beautiful fish. A few answers to the questions below could help give more clarity please. Well what are your parameters? It looks like you have another dwarf gourami in there, which could be due to fighting. What other tankmates? 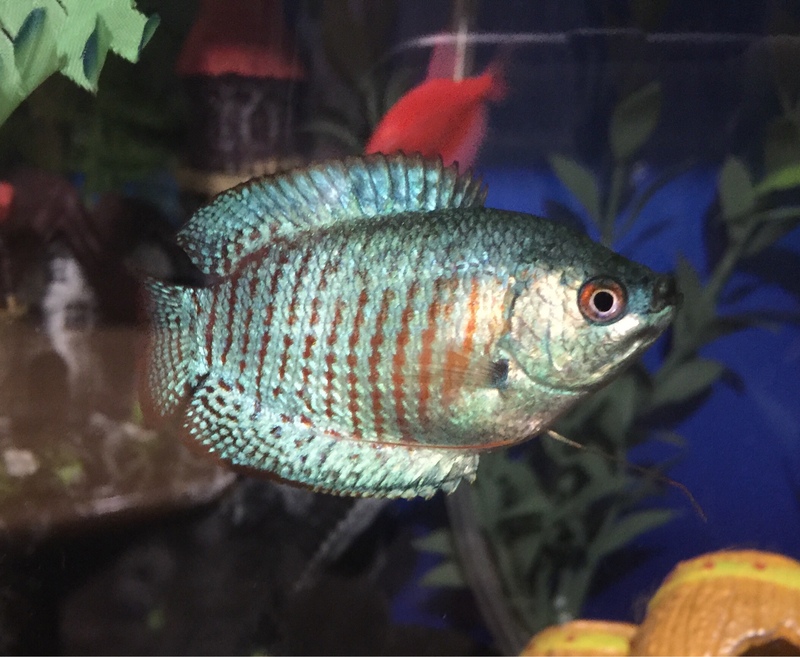 Dwarf Gourami also have a disease that is only contagious to other Dwarf Gourami, Iridovirus which can cause bumps. It has no cure and is unfortunately fatal. Checked the water yesterday. PH was around 7.2 ammonia was spot on 0 Nitrate was around 5 ppm. The tank is a 75gal with 2 penguin 350 biofilters, also have a bubble wall in it, live plants and driftwood. As for the stock i have 4 dwarf Gourami (including the one in question) 2 angel fish 1 bristlenose pleco and a senegal bichir. Iridovirus is found in bettas as well. We have already had corys die on this site because they came in contact with feces at the bottom of the tank. We need to be aware that this has crossed to different species of fish. This gourami is not exhibiting any of the normal signs of Iridovirus. I wish I could point to a specific cause but I can not with what I see. Are all the dwarf gourami males? I can see some fighting issues that could happen with that stocking for sure. Dwarf gourami, especially males, shouldn't really occupy the same tank. The angel fish and bichir could also be aggressors. @KimberlyG Sorry the information I have on Iridovirus said it causes bumps and is only contagious to dwarf gouramis. I haven't seen any new updates on that information. I have heard about Iridovirus in dwarfs before but i have never seen it in person so im not 100% sure how to identify it. Although i have heard the fish becomes very lethargic and eats very little. Which mine has not been doing but still want to play it safe and see if anyone knows whats wrong with him lol. Yes the dwarfs are all males. Could that possibly be a mark from one being agressive? i dont think it would be the bichir or the angles as they are all very young, The gourami are actually the largest fish in the tank.. for now anyway. That is not Iridovirus. It looks like a tuberculosis lesion - Mycobacter marinum. Personally, as harsh as it sounds, I would euthanize that fish immediately, using gloves if I had any open cuts on my hands. It looks like the disease in full spreading mode. That's why I wouldn't waste any time acting on it. The fish is doomed, and you do not want the pathogen to become an acute outbreak. It is hard to be sure from a photo, but if I saw that fish in a store, I'd surely run. It's a drastic diagnosis, but I have seen the disease before, and that looks familiar. If it is TB, it is a bacteria no fish med can handle. Humans can catch it - I did. Six months of antibiotics later, and it was gone. You may see why I would euthanize. All it does to humans is create the same sort of surface sores. A lot of fish carry it, and it shortens their lives. They encyst it internally, but when it breaks out it presents as a squared bump which eventually breaks open. The bacteria flood out, and can overwhelm other fish, which develop sores and die. Sometimes, healthy fish can encyst a new attack, and live about half their possible lifespan, before stress etc lets it break out. Symptoms are diverse, which is why everyone hates to do an educated guess/diagnosis. Wasting, flank sores, twisted spines and sudden deaths. It can always be seen as like something else, if there is no laboratory culture. The bump you are talking about is an enlargement of the spleen. It looks like the fish is bloated. It is not the red pimple type sore we see in the pictures. Fish will stop eating and will remain at the bottom breathing heavily (panting) With gouramis and betta, they often drown because they need to breathe from the surface as well as through their gills. Other non labyrinth fish will starve. It can take a while for the disease to show up. I have not seen that there is any treatment for it as of yet. It has damage on its head also. I expect they are fighting but think am.afraid the sore is a sign of Dwarf Gourami Disease. Ok so are we talking about the fish with stripes? Because I see a bump on both fish in the pictures. I have a DG and he doesn't have a bump like that anywhere. At least not that I have noticed anyways. Edit: after looking Otto is a bit lumpy I guess. Maybe the lighter blue one is just because of the light reflecting a certain way making a bump seem larger than it is. We have several credible diagnoses, which shows how little we know about what we can't see, the internal health of a fish. e) I'll add another, unknown bacteria, on a classic fishfarm linebred fish. They all make sense, and they are all possibilities. Of them all tb is the most serious, as it spreads aggressively, and is rampant on overcrowded fishfarms. In very rare cases, it can be a problem for us, as the only fish disease that can cross our species barrier. It's a key reason why I try to buy only wild sourced fish. Iridovirus (dwarf gourami disease) would kill the gouramis, but would not spread beyond them. It would be serious for that fish, but not others. We really are fumbling in the dark, trying to do our best with aquarium fish internal medicine. I would take the possibilities and research each, since you have the fish to look at, and see what seems the most logical to you. Either way, you will notice a shortage of real treatments. There is not much to be done - you have to stop the spread. 30 years ago, gouramis were my favourite fish, and I was fascinated by keeping and breeding them. Now, I have none in my tanks because of how diseased the ones coming from the farms tend to be. Raised bumps on the flank are really a common sight in pet stores, and since no one imports wild gouramis much any more, the fish farm diseases have sent me off to enjoy other groups of fishes. Before the Iridovirus was ID-ed, the common thought was it was TB that these fish caught. Problem with Iridovirus is it can have several symptoms. It "opens" the immunesystem and the fish dies cause of other infections. This definitely is one of the symptoms I have seen in hundreds of cases in the past years. Only an importban on these beautiful fish could safe these in my opinion.